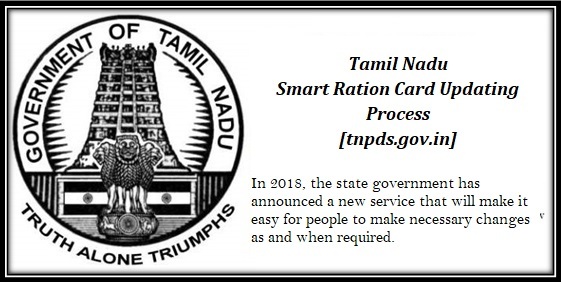 What is a smart ration card:- Smart Cards are a form of digital cards that are launched by the Tamil Nadu government. These cards are introduced by the government of Tamil Nadu with an aim to replace the already existing ration cards. With the implementation of these cards in the state it is expected that the government shall be able to digitalize family ration cards to the people in the state. A form will be opened. Please fill all the details in this form very carefully. After form has been succesfully filled. You will be provided with a reference number. Please save that for Tracking purpose. You will get this reference number on your email and mobile number. To get started with the process of registration applicants have to first log on to the official website tnpds.gov.in in the web browser. The moment you log in you have the option to select your preferred language. You can look around for the option at the sidebar from the main page. Once you have made the selection of the language you have to click on “application status” option for smart card. The link is available on the web page. From the next tab you then have to enter the reference number received on your mobile phone in the box provided. After this you just have to select “Submit” option. The moment you click submit option you shall be displayed with the status of your application. You can call 1907 or 18004255901 for any query relating to this particular scheme. The government of Tamil Nadu has already begun with the procedure to implement and launch smart cards for the local people. Apart from this the government has also announced the set budget of Rs 330 crore that it shall be spending in implementation and issuing of these cards to the people in the state. With the implementation of the new scheme the government also expects to replace around 1.89 crore old and traditional ration cards with newly introduced smart cards. Apart from this the government officials have also made it very clear that the process of replacing the old cards with smart cards shall not affect any consumer. As the process of replacing the old cards will be time consuming so it is certain that people who are holding old cards will be able to access purchasing rations using the old as well as new cards. The government has also stated that people will be able to purchase rations from any government valid PDC store or shops. According to local authorities it has been stated that the government officials have created a complete list of present ration card holders in the state. The officials have managed to store all this information in the digital medium in the form of database. The database thus created by the government is on the basis of all information provided by the Aadhar card committee. The database holds all possible information that is present in the customers Aadhar card. It is also certain that out of a total number of 6.90 crore people the government has managed to prepare a list of around 5.85 crore people in the state on the basis of their Aadhar card. Apart from this the government has already begun with the process of using this information and digitalize it to produce smart cards. According to the information it is certain that the entire cost of collecting the database and digitalizing it will be borne by the state government. Apart from this the government has also clearly stated that any expenditure that is involved in collecting the information shall also be borne by the state government. Once the database is collected and smart cards prepared the government shall also be bearing the expense of distributing these cards to the card holders. According to the local sources the government of Tamil Nadu has set to prepare smart cards for around 6.90 crore people of the state. With present procedures it is clear that the government has already digitalized the details of 5.85 crore people in the state. It is expected that smart card shall be launched in different districts in the state of Tamil Nadu. Presently the government aims to replace all traditional ration cards with smart cards in 32 various districts of Tamil Nadu. Presently there are around 1.89 crore ration card holders who are registered with the state government. These are spread across small and big districts in the state. Government aims to target nearly 6.90 crore card holders from these districts. Digitally government has claimed to register nearly 49 percent of the population who are ration card holders. One main benefit of smart ration card is that the people will be able to collect rations from any of the PDC stores in the state. As the information provide will be digitalized so it is certain that with the implementation of the smart card all fake and duplicate ration cards will be stopped. Apart from this the government also aims to monitoring the distribution of grocery commodities easily to different PDC shops and outlets. The monitoring can always be performed by the government in real time starting from warehouses to the retail outlet stores. Any user who is registered with the smart card will be able to collect ration from government valid stores at the pre-decided rates. Now here the candidate can modify the name, age, address, addition / deletion of new members. In the address bar type www.tnpds.gov.in which is the official website of Tamilnadu Public Distribution System. On the right hand side of the page you will find a heading “Correct Your Smart Card”, there you will find correction of details (Name, Age ETC). Another page will open which will ask the candidate for his registered mobile no. The candidate has to type the registered mobile no. And also there will be an image with certain characters in it which is called as the captcha image, the candidate has to type the characters in the image and click submit or hit the enter button on the keyboard. The candidate will receive an OTP on his mobile phone and also on the computer will redirect him to another page which will ask for his OTP. The candidate has to enter the OTP on the page displayed and verify himself. Then another page will open where the candidate can change his details which he wants to change then he has to submit the relevant documents. The documents can be in the form of JPEG, GIF or BMP format. The maximum size of the image should be not more than 100 kb. After uploading the documents the candidate has to click on submit button. After clicking on the submit button a pop will appear which will have a reference number which you will need to track the status of your request in near future. The status can be checked from the home page. where it says, check the status. Add/Delete member, Change the Name and Address. In addition to changes the TNPDS the candidate can add/delete a member and also can change the name and address. Similar to the change in name, the candidate has to visit, www.tnpds.gov.in, again in the right hand corner there is an option called Smart Card Related Services. there are various options under the heading where the candidate can add a member, delete a member change the address change the family head and cancel the card. All the candidate has to do is select the appropriate option that he wants to opt for. Once the correct 10 digit number is entered the candidate will get an OTP. And the page will redirect him to a page which will ask for the OTP no. Once the correct OTP is entered then the candidate will be redirected to the relevant page. According to his request he has to make the relevant changes and upload the related documents in jpeg, gif, bmp format not more than 100kb in size. The candidate will get a service request no. which will be useful to track the request made. All the requests made online are be serviced, the status of the request can be checked online in the check status online option. With the implementation of smart cards in the state it is certain that the process of monitoring and issuing ration cards will be much easier for the government bodies. Apart from this government can always be sure that all valid card holders can get the benefit of government outlets. This also means that getting illegal ration cards can now be regulated by the government.